What is it about shark movies that we find so attractive? Considering the real number of deaths from shark attacks in any given year is so small, why do we keep making movies about this kind of grisly end? 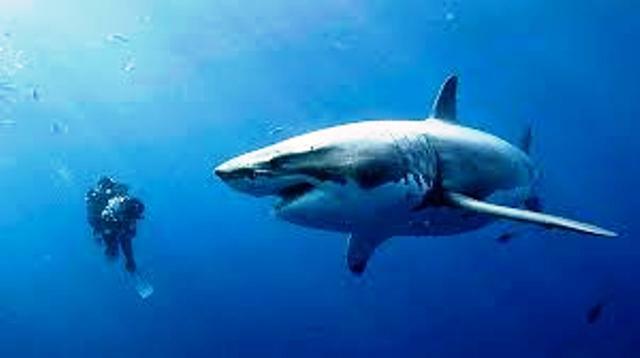 In fact, you could safely say that in the past few decades there have been more movies made about shark attacks than actual deaths from real sharks. From Steven Spielberg’s Jaws in 1975 to the current spate of Sharknado flicks, the list goes on and on, and most of them are decidedly B-movies. Which brings us to 47 Meters Down, which can safely be labelled a B+ movie. At the film’s start, we meet a couple of 20-something sisters, Kate (Claire Holt) and Lisa (Mandy Moore), on vacation in Mexico. We learn that Lisa has left her partner, Stuart, back home in the States and joined her more adventurous, younger sister for some holiday fun and a bit of R&R. During a night out at a club they meet a couple of local guys, Louis (Yani Gellman) and Benjamin (Santiago Segura), and are told about the ultimate thrill experience - entering the deep blue ocean with an oxygen tank in a cage suspended five metres down off a small boat, where they can get up-close-and-personal with some very large sharks – what’s not to like! The skipper of the boat, Captain Taylor (Matthew Modine), is a fairly laid back dude who doesn’t really follow the rules, like checking the sisters’ diving certificates. Lisa does suggest that it may be a dangerous proposition but, needless to say, they go ahead with the plan regardless. At that point you know that something is going to go horribly wrong because it always does in shark films. And sure enough, it does… the cable holding the cage is rusty and old and it breaks, sending the pair plummeting to the ocean floor, 47 metres down (Note the Aussie spelling, as against the ‘meter’ of the title). The remainder of the film is spent underwater, as Kate and Lisa desperately try to work out the best strategy to escape the circling sharks - at one stage, in a scene reminiscent of Jaws, one of the monsters even tries to eat the cage. And of course, they’ve limited air and the threat of the bends if they try to surface too fast. What’s a girl to do? 47 Meters Down provides an anxiety-inducing experience that gets the adrenaline pumping as you switch between feelings of claustrophobia and fear, despite being in the safety of your cinema seat. The CGI effects are highly realistic, except for one scene, and Roberts engages you until the very end, which is a cut above many of its ilk. There’s a line in the film where Kate declares that she only has 20 minutes of oxygen left in her tank and it comes as a relief, because by that stage you can’t wait to get back to the surface. If you’re into having a fright, being 47 metres under the ocean and spending an hour fighting for air, then this is an experience that’s definitely for you. But if you’re still getting over Jaws then you’re better off sticking to dry land.